Many of us start the new year with big fitness goals, but it can be hard to stay motivated when it’s freezing outside. On one hand, winter is a great time to rest and recover if you’re suffering from aches, pains, or an injury that threatens to keep you out of the gym long term. In fact, it’s a great season to recover with professional physical therapy that will help you get back to your strongest, healthiest self in time for spring and beyond! However, if the only thing that’s keeping you from pursuing your health goals is Old Man Winter, you can still get a great workout if you get creative and move the party indoors. With digital tools and some basic equipment, there are more options than ever for indoor workouts. You just need to know where to find them and how to keep your motivation up! Videos – Between the wide variety of workout DVDs available, YouTube, and fitness websites that have put together their own exercise videos, there is no shortage of video workout options. Videos are great for anyone who prefers to have the experience of a professional trainer to guide them. Even if you’re home working out by yourself, having the person on screen in your living room makes your workout feel more interactive than just doing it on your own. Workout videos also give you the option to find something you truly enjoy doing. Some of the best online workouts today are dance-inspired, so you aren’t limited to traditional exercise moves. App Workouts – Bringing the workout off of your TV and onto a mobile device gives you even more freedom and flexibility. Just as you can with videos, app workouts give you a wide variety of exercises to choose from and are typically very affordable. Depending on what you choose, they also give you the option to set goals and track your progress. Some apps generate custom workouts for you based on how you’re feeling each day, while others have built-in music playlists. Create Your Own Routine – Creating your own routine is the ultimate way to customize your workout. If you’re feeling stuck and in need of inspiration, use a website like FitnessMagazine.com to search for new moves that target exactly what you want to work on. When customizing your workout, be sure to keep it fresh by mixing things up so you don’t get bored. 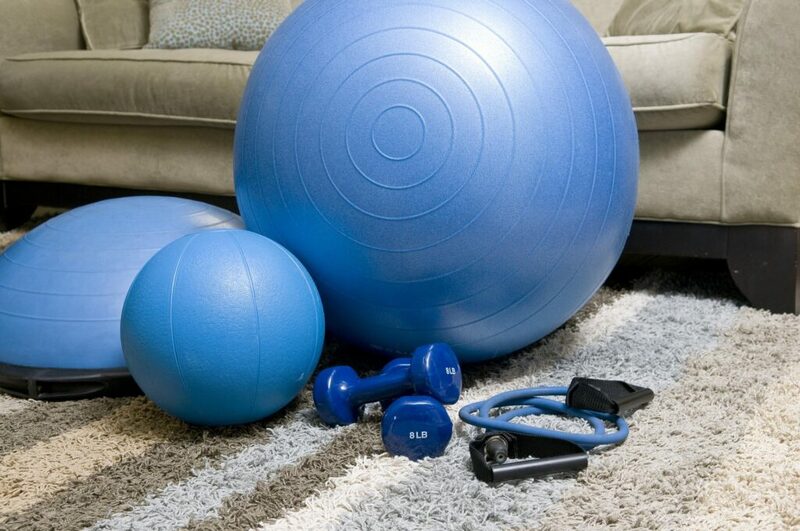 Set Yourself Up For Success – The best way to keep focused on your winter fitness goals is to set up a home gym. You can start with a few basic pieces of equipment, or you can splurge on a treadmill, stationary bike, or step machine. Two essential pieces of equipment for your home gym are a set of dumbbells and a yoga mat. The added weight from dumbbells increases resistance, giving your workout a major boost. Dumbbells are also incredibly versatile because they can be used in a variety of exercises to target the specific muscles you want to tone. Using a yoga mat is an easy way to instantly transform any room in your house into a gym. It gives you a solid foundation for any home exercise and then rolls up for easy storage. Crank Up Some Music – If the dark and cold weather has you feeling sluggish, there’s nothing like an upbeat playlist to get you moving. Music streaming services give you the option to pick a playlist that you can customize especially for your workouts. For something new, check out Billboard for the top fitness music trends. Set a Goal and Track Your Progress – It can be hard to stay focused on fitness when you don’t see immediate results. Stop and think about your “why” for getting fit, then set not only big goals but also smaller, measurable goals. Write them down somewhere you see them every day so they’re always in the front of your mind. When you set small goals and track them, you will be more aware of your increased strength, which is a powerful way to stay motivated and keep moving toward those bigger goals. Finally, winter is a great time of year to fix all the aches and pains that can make it difficult to enjoy your favorite activities in the warm weather. Runners, bikers, and hikers this is the perfect time to tune up your muscles and joints while helping to prevent injuries next year. Physical therapists are ideally suited to help you with developing a customized rehabilitation or injury prevention program. Call 508-675-3200 and make an appointment today! No matter how cold it gets, spring is around the corner. Don’t let the warmer days creep on you only to realize you’ve forgotten your wellness goals. Take whatever time you need to mend any injury you’ve suffered, or if you’re feeling strong, get creative to stay focused on home fitness all winter long. Either way, you’ll be ready for fun outdoor adventures when the warmer weather comes.